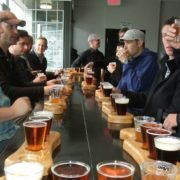 Ryan Mackey, who owns Vancouver Brewery Tours, cites similar reasons for why locals take his tours. The craft-beer scene is evolving so rapidly, he says, that many people simply haven’t had a chance to check out many of the city’s breweries. (The latest? In North Vancouver, Black Kettle Brewing Co. opened this month and Green Leaf Brewing Co. opened there in December.) His company, which launched last June, offers $69 tours every weekend that visit three breweries in three hours. He switches up stops between his eight partner breweries, which include Parallel 49 Brewing Company, Deep Cove Brewers and Distillers, and Dockside Brewing Company. At each brewery, participants are offered three or four samples. So why take a tour rather than visiting the breweries’ tasting rooms yourself? 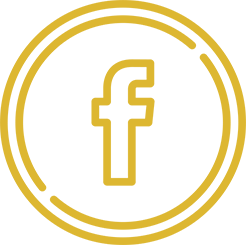 Mackey says that people enjoy taking a behind-the-scenes look at the breweries and the personal interaction with brewery staff. “When you meet the people who make your beer, you want to go back,” he explains. The tours include van transportation so that people don’t need to worry about drinking and driving. That makes them popular to book for private stag and staff parties. The tours are also a great way to meet people in famously clique-y Vancouver. Each one starts off with participants introducing themselves, and the ice breaks quickly with the first beer poured. On the tour the Straight covered, the whole group went on to socialize at a nearby pub afterward. Read the entire artlcle here. 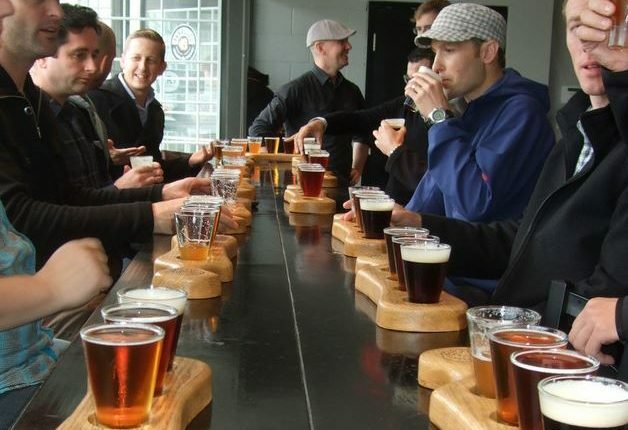 If you know someone who’s got a slight fixation on all things brew-related, then you need to put Vancouver Brewery Tours on their radar – or better yet, buy them a Brew Tour gift certificate for Christmas and hop along for the ride. 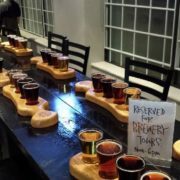 As Vancouver’s first and only company to focus exclusively on craft brewery tours, Vancouver Brewery Tours has carved themselves a nice little niche. Their simple goal being to connect beer fans with the burgeoning craft beer scene popping up around town. With half a dozen new breweries on the scene already (Powell Street Brewery, Bridge Brewery and Four Winds come to mind) establishing Vancouver as a premier tourist destination for craft beer tours makes complete sense. Beer lovers Ryan Mackey and Stephanie Soebagio joined forces to launch the company this past June and their tour company aims to offer guests an exclusive behind the scenes vantage point of the city’s craft breweries. With so much buzz around beer in YVR, tour destinations have been consistently changing – keeping tours (and brew) fresh. Don’t take our word for it, see what others have to say about our brewery tours! From the Vancouver Sun to the Georgia Straight, the word is getting out and we couldn’t be hoppier. Check out our Press page to read more.